It all started when some people wanted to return their vehicles from Namibia back to Germany. In social networks was looking for riders who should participate in the fuel costs. Spontaneously I got in touch, received a positive response and should arrive at the starting point in Namibia at the agreed time. Click hereto view the route in Google Earth or here to open the map in a new tab. Click here to view the route in Google Earth or here to open the map in a new tab. But first I wanted to go to Cape Town. As simple as thought, this project was not. When I did not have a return ticket at check-in, the German airline did not want to take me to South Africa. Just because I had already booked an Intercape bus ticket to another country online and could prove that I wanted to leave South Africa again, I was finally allowed to take the already paid flight. A worse customer service is not possible. 11 hours later, the official entry into South Africa was totally relaxed. Nobody asked for a return ticket or a security deposit. My friends brought me to Fishhoek, a very nice suburb of Capetown. I was very pleased that there are actually wild penguins here on the Indian Ocean or in the neighboring town of Simonstown on the way to the cape of good GPS 34 ° 21'25.32 "S 18 ° 28'25.41" E (GPS 34 ° 11 ' 44.18 "S 18 ° 26'59.41" E). I also found the many geckos that I found walking on Lions Head (GPS 33 ° 56'11.37 "S 18 ° 23'42.12" E) and Kirstenbosch Botanical Garden (GPS 33 ° 59'23.61 "S 18 ° 26 '1.64 "E) startled 6km onto Table Mountain (GPS 33 ° 57'28.29" S 18 ° 24'11.80 "E). Table Mountain, on sunny days, allows all those who enjoy a beautiful view of Capetown, either to master the very steep path, or to spend an hour using the cable car. Geckos are also found in the many ghettos that grow around Capetown. One day I got a little insight into the lifestyle of the people there, when my friends drove their gardener home to Masiphumelele. Here many families live together in very small so-called checks. These corrugated iron and wood huts usually have only one room, which is used both for sleeping and for cooking, while the real life takes place on the street. Not infrequently, there are fires here, which destroy not only many hectares of dry green space but also entire villages. Most residents, however, can not get themselves from such fires small. while the children play in the ruins and the women cook food, the men rebuild their huts within a few days with new wooden slats, old corrugated iron and everything else that is available. The time of the rebuilding is also used to relocate your own residence, if possible, closer to the public water points. From so much serenity and pragmatism in crisis management, we as Europeans can really learn something. Before going on to Namibia I visited the obligatory Cape of Good Hope for every tourist. Officially, tourists are allowed access to this windy place, which is by no means the southernmost point of Africa, only to the first lighthouse. However, I continued over some barriers until the second lighthouse. Here you could feel the full power of the wind, while a spray of waves splashed in the face. A moment in which you realize that nature is still stronger than man. After two nice weeks in Cape Town I drove by bus to Namibia and reached after 22 hours drive the city Windhoek. Here I was kindly picked up by Daniel (name changed by the editor) with his truck. Daniel, also German, lived and worked in Africa for several years before deciding to drive back to Germany with his truck. That this plan is no longer up to date, I learned a few minutes after my arrival. Instead of Kiel, I can go as far as Dar es Salaam in Tanzania. From there, most of the passengers would fly back to Germany anyway. The other fellow travelers I met the next evening in the famous restaurant Joes with crocodile roast and beer. while Georg, who has joined Daniel's tour with his own Unimog, explained to us the party program of his still-to-be-founded radical center, Till struggled with his huge "strong man" club. Silvia had worked in the orphanage after school and silently drank dessert. Henri toasted Sabine as John enlightened us about the latest world political events. Now missing next to Markus, who had to move the camper converted fire brigade, which Daniel had borrowed because of his numerous passengers, only Daniels wife and daughter. Both were picked up from the airport the next day. A little later, Markus arrived. Thus, the eleven-member crew of the three vehicles was complete and the journey could begin. Since the trip over the paved Kaprivi promised no special charm, we planned to drive through Botswana past the Okavango Delta through the Kalahari Desert to Maun and continue through the Chobe National Park to Kasane. That this route is considered impassable during the current rainy season did not stop us. The stages of the next days through the Calahari were, however, apart from some thunderstorms, rather harmless and well suited to get to know each other better and to get used to the camp fire around the campfire. while Georg and Daniel spent the night with their family in their two trucks, four people were spending the night in the two existing beds and on the ground. For the remaining three people were two tents available, which were as long as it was not raining also gladly set up. 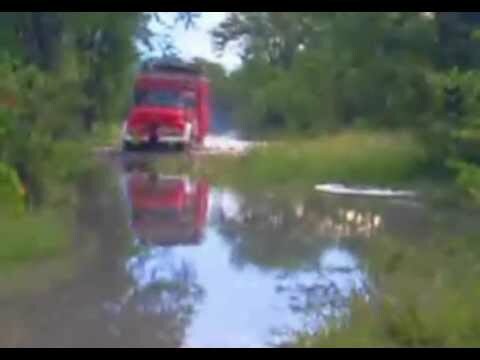 The more we approached the Okavango Delta, the more wet and soft the underground became, until finally our 12-ton fire department got stuck for the first time at a small river crossing. Thanks to Daniel's winch, however, it was not a problem to literally pull the vehicle out of the mud. On the other hand, it was much more difficult to find the "road" in the map and in the GPS through the jungle. This ended after many mud puddles before a lake, right next to the legacy of an elephant. Since we did not find any way to avoid the water, first tried the Unimog as the lightest and most off-road vehicle to cross the lake. In fact, the Unimog reached the other shore after 45 seconds of full throttle, without the engine swallowed water or Till and I got wet feet as a passenger. We were amazed when Markus made the decision to venture the sea passage with the fire brigade, as seen in the photos of Till Optenhögel and my video. As if by a miracle, this fully loaded four-wheel drive vehicle with no differential lock also reached the other side of the lake without getting stuck. Now Daniel also did not ask the cool sock for much longer. Full throttle he plowed through the lake with his all-terrain 1113 Rundhauber, see photo of Till Optenhögel and my video. He was the only one who managed to get not only water but also fish into the cab. A little later we set up our camp in the middle of elephant footprints and tall grass. Here, apart from civilization, it was important to take special care against snakes. Thus, the bite of a black mamba leads to death due to apnea within a few minutes. Likewise, one should avoid the bite of a Puffotter and make sure that no Speikobra blind. Even if we were not always running around with sunglasses, so we put emphasis on sturdy shoes and long pants. In addition, we moved forward as slowly as possible and stomping in the bush. With rustling noises we realized then that small animals were on the run from us. Of course, we were aware that can be driven by pounding no Puffotter. When we had loaded our vehicles again the next morning and wanted to continue driving, we realized that the coupling of the fire department did not work anymore. Probably a consequence of our maritime transit yesterday. First, Markus started the truck in a gear until the onboard batteries were weak. Then we made sure, with the help of a strong rubber tensioner, that the sluggish clutch re-engaged. Slowly we continued through huge mud holes in the middle of the widening dirt road in the direction of the Chobe National Park, whose gate we reached Mababe in the afternoon. Since we were denied the free transit passage through the park, it came between Daniel and the Parkrangern to strong differences, which were transmitted to our group. After tough negotiations, however, we were able to reach a good compromise. Since vehicles with more than 3.5 tons have to pay a much higher entrance fee than cars, we changed the weight of the 12-ton fire department in the vehicle papers accordingly and certified our change with the federal eagle of a lying around 1 DM piece. The ink pad was a felt tip pen. Since our other two vehicles were apparently smaller and lighter than the fire department, we did not need to provide proof for Daniel's 8-tonne Rundhauber and the 5-tonne Unimog before we could finally get the permit for the next day. The evening we spent in front of the gate of the non-fenced zoo. At night we were woken up by lion roars, rustling noises and cracking branches. In the moonlight, we saw that hyenas hit our garbage bags. The next morning, the starter of Daniel's truck stopped working. After Georg had put on the vehicle with his Unimog, we let ourselves into the park, because the rangers were not punctual. The barely visible path through the zoo again made high demands on us and our material. Although you can not get out in the park, the fire brigade got stuck in the mud and had to be pulled out by Daniel with the help of the winch. After only a few meters we saw the first lions and asked ourselves, what could have happened in the tent at night. We had a lot of fun in the park and were happy about the many different species we saw. At first zebras crossed our path, then we saw a giraffe standing in the distance next to a ostrich herd. A little farther on we met a herd of buffaloes and finally we saw our first elephant in the distance. A boat trip on the Chobe River is really recommendable. The further north we came, the more animals we saw. Towards the end of this beautiful wildlife reserve we met elephants again and again and suddenly had a herd of giraffes around us. We kept taking breaks and watching the behavior of the animals in the savannah. In the evening we had to hurry up to reach the other exit of the park in time before the gate closed after 100 kilometers. Here at the gate, we quickly filled up our water tanks, found that the fire water tank of the fire brigade licks through the twisting, and opened our camp a few miles further. The joy of our campfire and my tuna noodles did not last long. When we were startled by elephant roars at dusk, Daniel decided to drop everything and get us safely to safety in the vehicles. Luckily, the night went by without incident. After Georg Daniels truck has attracted, we left early the next day our sleeping space. After just a few kilometers, we realized that the front tire of the fire department looked somehow flat. However, since we had some spare wheels on the roof, the exchange was done quickly. After that, we followed the sandy track until we approached the caprivi strip of Namibia in the afternoon. Here, back in civilization, we took a break to sort out internal group disagreements. A final, Markus cellphone rang. The result of this call was that Markus had to leave our group to return to his company in Namibia as soon as possible. So I became the driver of the fire department. While Daniel Markus drove to the Namibian border, we drove to the next city to catch up on our scarce food supplies and especially our fuel reserves before entering the most expensive country in Africa again. Then we drove together with our relatively short vehicles past a kilometer-long line of trucks, which have to wait here for up to 7 days for a crossing, to the docking point of the Kazungula ferry where we pitched our camp. The next morning we completed the necessary departure formalities very early and waited for the ferry at sunrise. With a little queasy feeling we squeezed one after another with our vehicles to one of the huge trucks on the rickety boat. However, everything went well and so we were able to leave the ferry after a short time on the other shore (thanks Till Optenhögel for the photo in which I plow with the fire department through the water). There was absolute chaos here. Trucks criss-crossed everywhere so we could barely get through and subsequent trucks could not leave the ferry. As soon as we were recognized as white, many people rushed to sell us something. We chose a guide who wanted to help us through the immigration formalities to Zambia. While at least one of us kept an eye on the vehicles, it was necessary to get the necessary visas for $ 50 per person. The destination was Livingston. A transit visa would have been more expensive at $ 75. Incidentally, for US Americans, the visa cost $ 130. Subsequently, the customs documents for the vehicles had to be filled out and stamped (we did not use the Carnet de Passage customs documents throughout the tour, although the fire department was driving with a German license plate). Then, for every vehicle, a 2500 quatscha or 50 euro, one-month insurance had to be taken out and paid in local currency. Afterwards we paid the ferry crossing and got a mandatory police temple for the drivers. Now only the carbon tax and the roadtax were missing for each vehicle. The latter we solved only to Livingstone, as our budget was gradually running out. Although this led to dissuasions at the exit, but saved us a fortune. Late in the afternoon it could finally continue after Daniel has changed his diesel filter. A few kilometers further we noticed a campsite, in front of the gate of a Trabbi stood. Curious, we decided to spend the following night here in Nonamecamp. The German owner not only let us use his internet but also told us how difficult it is in a country like Zambia to get the necessary permits and stamps for running their own business. Also it is not easy and extremely expensive to get alcoholic drinks for the bar and ingredients for the restaurant. while Daniel stayed at the campsite the next day to disassemble and cleanse his starter, we visited the Victoria Falls. Since there was a rainy season, a gigantic spectacle of nature offered itself to all the senses. Dressed in bathing trunks and flip-flops, we walked past the thundering waterfalls, of which we saw little more than a white spray-wall. At the same time the sun was shining and whipped water pattered down on us. Rarely have we had so much fun and were so wet at the same time. On the way to the "Boiling Pott" below the waterfalls, we dried again quickly. Through tropical jungle we hiked over rocks and through streams and past monkeys. Once at the bottom we saw huge masses of water forming a vortex before continuing on their way under the bridge leading to Zimbabwe. We witnessed a man dare the 111-meter bungee jump into the depths of the Zambezi River, just as Charley Boorman was on his long way down with his friend Ewan McGregor on his way from Scotland to South Africa , The Galileo show on 06.06.2013 is about this rope being torn when an Australian jumped. Our way, however, led us further northeast. One evening we were allowed to pitch our camp on a farm. We were cooking our dinner when the children of the nearby farm workers came to us to watch us with interest all night long. In Lusaka, we were hardly noticed, as we spent a night in the parking lot of a large supermarket chain. Previously, we had stopped a few days on the grounds of Mercedes to get our trucks lubricated thoroughly. Now the coupling of the fire department worked again. In the evening, two dodgy characters picked up our passport photos to get us a truck driver's license overnight. Unfortunately we never heard from the two again. That was not too bad, because whenever a police officer stopped us for the next gas station, we gasped before he could ask for our documents. Later, for safety reasons, I got a potato stamp in the truck box of my international driver's license. Georg had organized a parking space for his Unimog during our time in Lusaka and left us because work was waiting for him in Germany. Henri also left us to visit friends. A few days later, Daniel's wife also wanted to fly back to Germany with her daughter. Therefore, Daniel left his truck in Lusaka, while five of us slowly continued our journey with the fire department. We drove through beautiful, hilly landscape and found towards evening a nice parking space off the potholed street. Since I did not want to risk locking the fire brigade without Daniel's winch nearby, I got out of the car and just walked in with a pair of sneakers and shorts into the one-meter-high grass to check whether the ground was muddy or solid enough for the 12-tonne Vehicle is. At the same time I suddenly felt a sharp pain in the heel of my left foot. Obviously I had stepped on a snake in the high grass, which proved two small punctures. Immediately I remembered what I had heard before about snakes: "There is the black mamba in Africa, your bite is deadly within 3 minutes, so you have just left the time for a cigarette and a text message." When I did not smoke and had two days' travel from the nearest town I did not have a reception, I reached for the kitchen knife and cut deeply into the heel to bleed the poison. Fortunately, this incident was without further consequences. After all, there are also many non-poisonous snakes in Africa. We were just about to start a campfire and pack potatoes in aluminum foil when we once again got to visit curious kids from the neighborhood. The children showed us their round huts and the huts of their neighbors the next day. The people here do not only live on banana and corn but also keep chickens and goats and even have breeding tanks for fish that are later sold on the market. In contrast to large cities where we were treated as whites basically just like money on legs, we were greeted here everywhere very friendly and without pressing in any way. We stayed two days, then we moved on towards the Malawian border. In a small village we tried to buy bread and fresh vegetables. Unfortunately we were once again massively harassed by beggars who even tried to get on our descent. Only by a brave kick on the accelerator I could stop her. Our camp we hid relatively well hidden away from the road. Sabine prepared over the campfire bread to which we eat together with pre-cooked baked potatoes and Silvia's tomato salad. A real treat, if only the mosquitoes had not been. Against malaria, some of us weekly took Lariam as a preventive measure. Others were more likely to rely on plastic-dissolving anti-mosquito sprays or doom. For emergencies we had some packs of Coartem with us. The next day we reached the border to Malawi. Here we met again on a campsite with Daniel. Together, we completed the US $ 38 vehicle insurance for Malawi the next morning and completed the US $ 10 reasonable border formalities, which had to be paid in local currency, which we first had to find. Much of the border officials on what the numerous police checks had previously escaped: that we had previously paid $ 80 per vehicle too little Roadtax. Since we blocked the border with our trucks, after some back and forth, however, was no longer insisting on paying this fee. A few kilometers further, the Malawi officials insisted on paying the $ 51 road toll per vehicle for their land. In general, the Malawi officials took their job much more seriously than their colleagues before. Checks could only be prevented by asking the officials immediately after stopping for the next gas station, etc. After a great off-road stage from Lelongwe to Dobra, in the evening we were fortunately granted permission to spend a night directly on Lake Malawi on the private beach of a sugarcane plantation. After the exertion and heat of the last days, it was great to be able to finally swim properly and to be able to wash my clothes. We no longer had any fear of the schistosomiasis or schistosomiasis. Too often we had already come in contact with stagnant water. Instead, we planned a visit to the doctor or the prophylactic intake of praziquantel after the trip. Easter we celebrated a little further north on a campsite right on the lake. Here, Till and I were able to rent a catamaran as owner of a sailing license, which made our now only six-member group a lot of fun. So it was all in the green (internal). That at the same time at the neighboring beach, a woman from crocodiles, which were occasionally rinsed during the rainy season in the Lake Malawi, we learned later. We enjoyed life and went out to eat delicious food before moving north after a few days. On the way we had to stop again and again and search for diesel filters for Daniel's truck in many small shops. We are increasingly assuming that the problem is not due to dirty fuel but to a defective diesel pump. The entry into Tanzania went smoothly, apart from strong tensions within the group. In addition to $ 50 per person for the passport visa stamp, a $ 57 road fee per truck was due a few miles beyond the border. The prescribed insurance we saved, because this was not controlled. We took a few miles back, then we set up our camp again off the road. The next morning we were just about to clear our breakfast when suddenly many men approached us. They were armed with machetes and rifles and asked us to follow them into their office. while Daniel vainly asked the men for their IDs and tried to figure out what they wanted from us, we quickly got the vehicles ready to go. As the situation worsened, negotiations did not seem to succeed, and the first one brought his rifle from shoulder to shoulder, we decided to disappear. At first we seemed to be following the people's hand signals. Then, however, I turned off at full throttle in the direction of the main road, constantly in the expectation of falling shots. In the rearview mirror I saw Daniel following. Thanks to all-wheel we mastered the muddy street ditch with strong distortion of the chassis, reached the paved pothole track to Iringa and gave cloth. In Iringa we searched in vain for diesel filters again, went shopping and visited an Internet cafe. We were allowed to spend the night on the property of a friendly German, whom we met on the way and Daniel made a job offer as a mechanic. Part of the dirt road in the direction of Dodoma consisted partly of corrugated iron made of extremely heavy gravel. If you drove slowly, it rattled in the vehicle you thought it would crumble right away. If you drove fast, you threatened to lose your axles in suddenly appearing, deep potholes. For this route we needed two days. We stayed between acacia and thick Baobab monkey bread trees in the Hehe area. These awoke us in the morning by eerie, unrhytmische tones that drew the locals a Fidel-like instrument. In Dodoma, we searched in vain for a Mercedes branch to buy engine bolts for the fire department, which we had lost along the way and which Daniel has provisionally replaced by normal, unhardened screws so that the engine does not drag on the radiator. Since Daniel had also installed his shower water pump to support his diesel pump in his tank, we decided not to go to the Arushapark and the Kilimanjaro and decided to drive directly to Dar es Salaam the next day. We had just reached the traffic jam towards Dar es Salaam when we realized that Daniel's truck has a plate. When our tool was also stolen while we were blowing up the spare tire with the help of the onboard compressor, the mood within the group reached a low point. Daniel decided to break off the tour and accept a job offer in Malawi. First time, however, we drove to the nearest Mercedes branch, where we stayed overnight. The next day, Daniel was sent to Bosch, where his starter and diesel pump were repaired. Meanwhile, we went to the beach with the fire department and enjoyed the Indian Ocean, as our missing engine bolts could be delivered at the earliest three weeks later. Afterwards, like our two girls, I booked a return ticket to Germany. Since we still had some days left until our flight, we decided to take a second attempt to see the Kilimanjaro (see picture) and the Arusha Zoo. With Scandinavia bus travel we drove 600 kilometers to Arusha and quartered ourselves in a small hotel. In the next days we asked about different possibilities to visit the Arusha zoo, booked a tour and visited a big market. Here not only many bananas but also all other things of daily life were sold like shoes made of old tires. Also, various materials were offered, from which even on site with the help of mechanical sewing machines clothes were nourished. At the other end of the market, men traded in goats, sheep and cows. The polygamous men of the Massey were dressed according to their tradition and all had a stick and a knife. Punctually at 10 our driver picked us up with his Toyota Landcruiser the next morning in the rain at our hotel. Unfortunately, we were already after a few meters with lack of fuel. Our driver had simply forgotten to refuel. He organized a taxi, which brought him a canister full of diesel. Since this was of course not enough for our booked tour through the Arusha zoo, we drove to the gas station. When turning our driver overlooked an oncoming taxi and collided head-on with him. Fortunately, nobody was seriously injured in this accident, so we were able to continue our trip a little later with another driver and another Landcruiser. After the first few meters in the Arushapark it stopped raining and we saw the first giraffe standing in the street. It was followed by numerous species in the course of the day. In a clearing we saw a herd of buffaloes and some zebras grazing. In a clearing we saw a herd of buffaloes and some zebras grazing. At the other end of the zoo, an armed ranger was already waiting to take us on a walk-in for several hours. Here we saw again a large herd of buffalo as well as wild boars and some monkeys. On the way back we suddenly found ourselves in the middle of about 20 heads of giraffe. We were amazed how well such big animals can hide in the thicket. On the following day we drove with a Daladala, a local bus in which more than twice as many people are transported as usual in Europe, 100 kilometers to Moschi. Here a bad flu forced me to stay in the hotel, while the others went hiking at the foot of Kilimanjaro. An ascent of the mountain would have cost around $ 1,000. Unfortunately, the highest mountain in Africa was hidden in dense clouds all the time. Back to Dar es Salaam, we wanted to treat ourselves to luxury again and drive with Scandinavia. Unfortunately, the bus had a motor failure on the way and remained standing until hours later, the spare part needed finally with another bus from somewhere was brought. This extended our travel time from 6 to over 15 hours, which was not conducive to my ailing health. When we finally arrived in Dar es Salaam around three in the morning, we pitched our tents directly in the concourse and tried to sleep for a few hours. Then we took a taxi to Daniel, who was now standing on the site of a tire company, got our last things out of the fire department and drove back to the beach. Here we spent five our last common day. The next morning Silvia and I flew with Qatar Airlines to Qatar, where our paths separated. For 15 hours I froze in the air-conditioned hall of the hottest country in the world, before moving on to Munich in a very comfortable and well-equipped plane. My buddy, who had come specially to pick me up at the airport, I would like to sincerely thank: At some point we also make a trip together (see here ). All statements without guarantee. All actions are fictitious. Similarities to real existing places or persons are purely coincidental. I did not stay in Europe for long. As I wanted to get to know other exciting countries in Africa, my journey continues here.